Show detailsRockville (MD): Agency for Healthcare Research and Quality (US); 2006 Feb-. Anne Pfuntner, Lauren M Wier, MPH, and Claudia Steiner, MD, MPH. Health care expenditures in the United States account for nearly 18 percent of the Gross Domestic Product (GDP).1 Importantly, inpatient hospital costs account for nearly one-third of all health care expenses for the civilian noninstitutionalized population in the United States.2 The Agency for Healthcare Research and Quality provides an annual overview of national statistics on inpatient hospital stays, including their associated costs, using data from the Healthcare Cost and Utilization Project (HCUP). This Statistical Brief provides the most current data on costs for stays in community hospitals in the United States using data from 2011 and compares the results to data from 1997. Statistics on costs are included for stays by age, primary payer, major diagnostic category, and principal diagnosis. All differences between estimates noted in the text are statistically significant at the .001 level or better. In 2011, the aggregate cost for all hospital stays was $387.3 billion—a mean of $10,000 per stay. Together, adults aged 45–64 years and 65–84 years accounted for nearly two-thirds of aggregate hospital costs and had the highest mean costs per stay in 2011 ($12,500 and $12,600, respectively). Circulatory conditions accounted for the largest share (18 percent) of hospital costs in 2011. Stays with septicemia had the highest aggregate hospital costs in 2011 ($20.3 billion), which more than quadrupled since 1997 with an 11.5 percent annual increase. The aggregate cost for stays with acute and unspecified renal failure increased in rank from 54th in 1997 to 20th in 2011, as costs for stays with renal failure more than quadrupled since 1997. Aggregate inflation-adjusted costs for hospital stays increased 3.6 percent annually between 1997 and 2011, with 2.8 percent annual growth in the intensity of services (cost per stay) and 1.0 percent annual growth in the population. In 2011, the aggregate cost for all hospital stays was $387.3 billion—an average of $10,000 per stay. Figure 1 shows the distribution of aggregate hospital costs and stays by age for 2011, and Figure 2 displays the mean cost per hospital stay by age. Together, adults aged 45–64 years and 65–84 years accounted for nearly two-thirds of aggregate hospital costs and over half of hospital stays in 2011. Adults aged 45–64 years and 65–84 years also had the highest mean costs per stay ($12,500 and $12,600, respectively), which exceeded the average cost for all hospital stays. Adults aged 18–44 years accounted for 18 percent of aggregate hospital costs and nearly one-quarter of hospital stays. The mean cost per stay for these patients ($7,400) was 35 percent lower than the average cost for all stays. Infants younger than 1 year accounted for 5 percent of aggregate hospital costs and 11 percent of hospitalizations. The mean cost per stay for infants ($4,500) was less than half of the average for all stays. The mean cost per stay for children aged 1–17 years ($8,400) and adults aged 85 years and older ($9,900) was similar to the overall average cost per stay. Figures 3 and 4 highlight the distribution of aggregate hospital costs and stays by payer and the mean hospital cost per stay by payer in 2011, respectively. Stays billed to Medicare and Medicaid together accounted for 63 percent of aggregate hospital costs and 60 percent of hospital stays in 2011. Forty-seven percent of aggregate costs were billed to Medicare, and the mean cost for stays billed to Medicare ($11,900) was nearly $2,000 higher than the overall average cost per stay. At $8,000, the mean cost per stay billed to Medicaid was $2,000 less than the average cost for all stays. Private insurance was the expected primary payer for nearly one-third of aggregate hospital costs and hospital stays in 2011. The mean cost per stay billed to private insurance ($9,200) was similar to that for all stays. Stays billed to the uninsured and other payers each accounted for 4 percent of aggregate hospital costs. The mean cost per stay for stays billed to the uninsured ($8,300) was lower than the overall average cost, and the mean cost for stays billed to other payers ($10,700) was similar to that for all stays. In 2011, 70 percent of aggregate hospital costs were attributable to seven major diagnostic categories (Figure 5). Circulatory conditions accounted for the largest share (18 percent) of hospital costs. Musculoskeletal conditions (14 percent) and respiratory conditions (11 percent) also accounted for large shares of hospital costs. Digestive conditions, nervous system conditions, infectious and parasitic diseases, and pregnancy and childbirth-related conditions each accounted for between 5 and 9 percent of aggregate costs. Aggregate costs for hospital stays by principal diagnosis, 1997 and 2011. Stays with septicemia had the highest aggregate hospital costs in 2011 ($20.3 billion), which more than quadrupled since 1997 (an 11.5 percent annual increase). Costs for stays with septicemia were ranked 9th in 1997, fell to 13th in 2000, moved to 8th in 2004, 3rd by 2007, and have been ranked as the most expensive condition since 2008 (data for intermediate years not shown). Cardiovascular conditions accounted for five of the specific diagnoses for stays with the highest aggregate costs: acute myocardial infarction, congestive heart failure, coronary atherosclerosis, acute cerebrovascular disease, and cardiac dysrhythmias. When combined, costs for stays with these five cardiovascular conditions accounted for 13 percent of aggregate costs in 2011. The aggregate cost for stays with coronary atherosclerosis decreased 34 percent between 1997 and 2011 (3 percent annually), but the cost per stay increased 52 percent during this time period. The mean cost for stays with eight principal diagnoses was more than 50 percent higher than the overall mean cost for stays in 2011 ($10,000): septicemia ($18,600), osteoarthritis ($15,400), complication of device ($18,500), acute myocardial infarction ($18,900), spondylosis ($16,800), coronary atherosclerosis ($17,200), respiratory failure ($21,700), and hip fracture ($15,400). The aggregate cost for stays with acute and unspecified renal failure more than quadrupled from $1.0 billion in 1997 to $4.7 billion in 2011 (an 11.4 percent average annual increase). During this period, the change in rank for costs for stays with renal failure was gradual: these costs ranked 54th in 1997, 43rd by 2002, jumped to 34th in 2003, were 19th by 2007, fell to 23rd in 2010, and then rose to 20th in 2011 (data for intermediate years not shown). Figure 6 shows the average annual percentage change in aggregate hospital costs between 1997 and 2011 for the 20 principal diagnoses with the highest aggregate costs in 2011. Aggregate inflation-adjusted costs for all hospital stays increased 3.6 percent annually between 1997 and 2011. Across all diagnoses, intensity of services provided during the hospital stay (cost per stay) increased 2.8 percent annually, population grew 1.0 percent annually, and the number of stays per 10,000 population remained stable. The hospitalization rate (stays per population) was the most important factor in cost growth for 4 of the 20 diagnoses that ranked among the most costly stays: acute and unspecified renal failure, septicemia, osteoarthritis, and adult respiratory failure. Higher intensity of services (increased cost per stay) accounted for a large portion of growth in hospital costs for stays with eight principal diagnoses: back problems, both complication diagnoses, cardiac dysrhythmias, newborns, biliary tract disease, diabetes, and rehabilitation care. For stays with a principal diagnosis of chronic obstructive pulmonary disease, growth in the hospitalization rate and intensity of services contributed equally to average annual aggregate cost growth. For six diagnoses, growth in cost per stay was offset by a decline in the hospitalization rate. This included four of the five cardiovascular conditions that were among the most expensive stays in 2011 as well as hip fracture and pneumonia. CCS categorizes ICD-9-CM diagnoses into a manageable number of clinically meaningful categories.7 This “clinical grouper” makes it easier to quickly understand patterns of diagnoses. CCS categories identified as “Other” typically are not reported; these categories include miscellaneous, otherwise unclassifiable diagnoses that may be difficult to interpret as a group. DRGs constitute a patient classification system that categorizes patients into groups that are clinically coherent and homogeneous with respect to resource use. DRGs group patients according to diagnosis, type of treatment (procedures), age, and other relevant criteria. MDCs are broad groups of DRGs that relate to an organ or a system and not to an etiology (for example, MDC 06, Diseases and Disorders of the Digestive System). Each hospital stay has one DRG and one MDC assigned to it. Total hospital charges were converted to costs using HCUP Cost-to-Charge Ratios based on hospital accounting reports from the Centers for Medicare & Medicaid Services (CMS).8Costs will reflect the actual expenses incurred in the production of hospital services, such as wages, supplies, and utility costs; charges represent the amount a hospital billed for the case. For each hospital, a hospital-wide cost-to-charge ratio is used. Hospital charges reflect the amount the hospital billed for the entire hospital stay and do not include professional (physician) fees. For the purposes of this Statistical Brief, costs are reported to the nearest hundred. For more information about HCUP, visit [www.hcup-us.ahrq.gov]. For additional HCUP statistics, visit HCUPnet, our interactive query system, at [hcupnet.ahrq.gov]. Introduction to the HCUP Nationwide Inpatient Sample, 2011. Online. June 2013. U.S. Agency for Healthcare Research and Quality. [www.hcupus.ahrq.gov]. Accessed November 12, 2013. Houchens R, Elixhauser A. Final Report on Calculating Nationwide Inpatient Sample (NIS) Variances, 2001. HCUP Methods Series Report #2003-2. Online. June 2005 (revised June 6, 2005). U.S. Agency for Healthcare Research and Quality. [www.hcup-us.ahrq.gov]. Accessed November 12, 2013. Houchens RL, Elixhauser A. Using the HCUP Nationwide Inpatient Sample to Estimate Trends. (Updated for 1988–2004). HCUP Methods Series Report #2006–05. Online. August 18, 2006. U.S. Agency for Healthcare Research and Quality. [www.hcup-us.ahrq.gov]. Accessed November 12, 2013. National Health Expenditures 2011 Highlights. Centers for Medicare & Medicaid Services; [November 12, 2013]. [www.cms.gov]..
Carper K, Machlin SR. Statistical Brief #396. Rockville, MD: Agency for Healthcare Research and Quality; Jan, 2013. [November 12, 2013]. National Health Care Expenses in the U.S. Civilian Noninstitutionalized Population, 2010. [meps.ahrq.gov]..
Pfuntner A. HCUP Statistical Brief #146. Rockville, MD: Agency for Healthcare Research and Quality; Jan, 2013. [November 12, 2013]. (Truven Health Analytics), Wier, LM (Truven Health Analytics), Steiner, C (AHRQ). Costs for Hospital Stays in the United States, 2010. [www.hcup-us.ahrq.gov]..
HCUP Facts Figures. Healthcare Cost and Utilization Project (HCUP). Rockville, MD: Agency for Healthcare Research and Quality; Jun, 2013. [November 12, 2013]. [www.hcup-us.ahrq.gov]..
Bureau of Economic Analysis. National Data. Section 1, Domestic Product and Income. Table 1.1.4, Price Indexes for Gross Domestic Product. [November 12, 2013]. [www.bea.gov]..
Barrett M, Lopez-Gonzalez L, Coffey R, Levit K. HCUP Methods Series Report #2013-01. U.S. Agency for Healthcare Research and Quality; Mar 8, 2013. [November 12, 2013]. Population Denominator Data for use with the HCUP Databases (Updated with 2012 Population data). Online. [www.hcup-us.ahrq.gov]..
HCUP Clinical Classifications Software (CCS). Healthcare Cost and Utilization Project (HCUP). U.S. Agency for Healthcare Research and Quality; [November 12, 2013]. Rockville, MD. Updated November 2013. [www.hcup-us.ahrq.gov]..
HCUP Cost-to-Charge Ratio Files (CCR). Healthcare Cost and Utilization Project (HCUP). Rockville, MD: U.S. Agency for Healthcare Research and Quality; 2001–2009. [November 12, 2013]. Updated August 2013. [www.hcup-us.ahrq.gov]..
About the NIS The HCUP Nationwide Inpatient Sample (NIS) is a nationwide database of hospital inpatient stays. The NIS is nationally representative of all community hospitals (i.e., short-term, non-Federal, nonrehabilitation hospitals). The NIS is a sample of hospitals and includes all patients from each hospital, regardless of payer. It is drawn from a sampling frame that contains hospitals constituting more than 95 percent of all discharges in the United States. The vast size of the NIS allows the study of topics at both the national and regional levels for specific subgroups of patients. In addition, NIS data are standardized across years to facilitate ease of use. About HCUPnet HCUPnet is an online query system that offers instant access to the largest set of all-payer health care databases publicly available. HCUPnet has an easy step-by-step query system, allowing for tables and graphs to be generated on national and regional statistics as well as trends for community hospitals in the United States. HCUPnet generates statistics using data from HCUP's Nationwide Inpatient Sample (NIS), the Kids' Inpatient Database (KID), the Nationwide Emergency Department Sample (NEDS), the State Inpatient Databases (SID), and the State Emergency Department Databases (SEDD). Suggested Citation Pfuntner A (Truven Health Analytics), Wier LM (Truven Health Analytics), Steiner C (AHRQ). Costs for Hospital Stays in the United States, 2011. HCUP Statistical Brief #168. December 2013. Agency for Healthcare Research and Quality, Rockville, MD. [www.hcup-us.ahrq.gov]. Cite this PagePfuntner A, Wier LM, Steiner C. Costs for Hospital Stays in the United States, 2011: Statistical Brief #168. 2013 Dec. 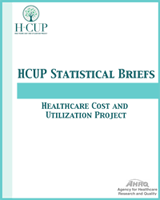 In: Healthcare Cost and Utilization Project (HCUP) Statistical Briefs [Internet]. Rockville (MD): Agency for Healthcare Research and Quality (US); 2006 Feb-.